Click the above picture to make it full-size. This comes from a post from Sonny on his tumblr blog in February. Find the original post here. 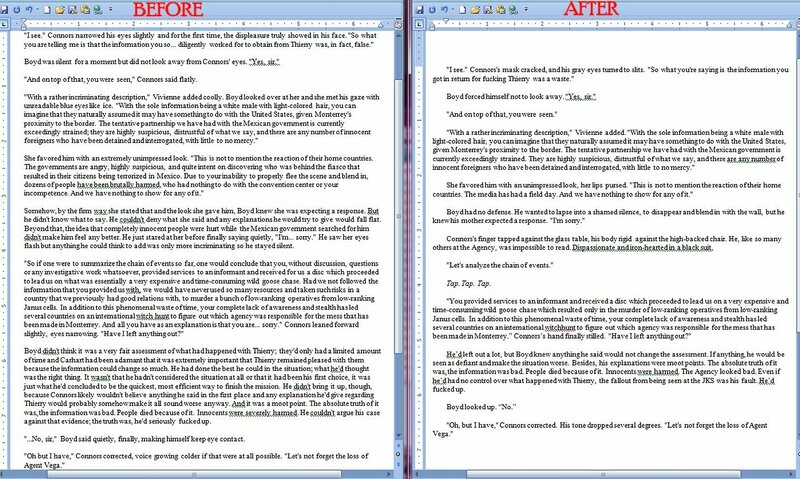 For ICoS readers and interested parties, this is an example of the kind of editing we have been doing to trim the fat and cut down that insane word count. We’ve cut a few scenes and a rare chapter, but rest assured we have not gotten rid of anything that was necessary for the plot or development of the characters. The above is part of an edit from one of my “quadrants”. We split the first book into 4 parts and are each tackling a chunk. For this quad, the original word count was nearly 170K. And that is only for the last 1/4 of the book! My target wordcount is 75K. So far I’m up to 138K and I haven’t even gotten to Boyd’s trip to the Fourth. Note: Still hasn’t been checked by Ais or a proofer. It’s all raw edits.